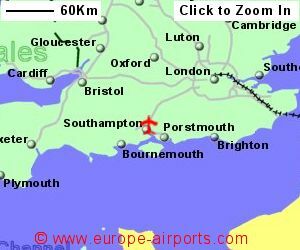 It is a very short walk (50m) from the airport terminal to the Southampton Airport railway station, where there are upto 3 trains per hour to London, the fastest trains making the journey in 66 minutes. The train into Southampton takes 8 minutes. Two bus companies operate services from the airport running into Southampton. Uni-link runs a service, every 15 mins during the week or every 20 minutes at the week end, from the airport to the city centre, university, and water front - some buses have WiFi. 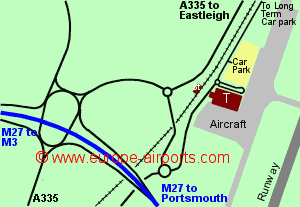 Short term parking is located immediately opposite the terminal building while the long term car park is at a distance of approximately 1.3km with a shuttle bus running every 10 minutes. Southampton airport has 4 bars/cafes/restaurants, 3 shops, an executive lounge, ATM's (some dispensing Euros or British Pounds), a pre-ordered currency collection facility, Internet access points, laptop plug-in points, luggage lockers, and WiFi Internet access (FREE for 4 hours). 2.0 million passengers passed through Southampton airport in 2017, an increase of 6% from the previous year.